Bullard just got tougher AGAIN. The new Firedome LT structural fire helmet is the result of 20 years of Bullard engineered polymers technology and expertise. Featuring a completely new streamlined design, LT Series helmets incorporate recommendations from leading veteran fire and federal government professionals. Bullard LT helmets come standard with the all-new and innovative, patented Quick-Attach? Blade System. This system permits the firefighter to simply press on or off either a blade-mounted faceshield or blade-mounted goggle in seconds. This flexibility gives the firefighter the advantage of the right option for the right application without time consuming component changes. The NEW Bullard Tough LT can be enhanced with a variety of optically correct visors, goggles, and neck protectors to equip your fire department with complete head, face and neck protection to meet your specific applications. Helmets are shipped within 4 business days after receipt of an order. With the new, compact design and lower center of gravity, the LT keeps weight evenly distributed and holds the helmet stable on the head. The versatile sizing system includes a new height adjustment feature, as well as Bullard's exclusive Sure-LockÃ?Â® ratchet headband that fits to the size of the wearer's head with a quick turn of the knob. 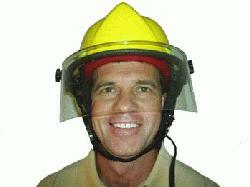 The brow pad is washable and replaceable; a unique feature for fire helmets. Bullard LT Series helmets come standard with the all-new and innovative Quick-Attach Blade System. This system permits the firefighter to simply press on or off either a blade-mounted faceshield or blade-mounted goggle in seconds. This flexibility gives the firefighter the advantage of the right option for the right application without time consuming component changes.